AP Photo TCU guard Kenrich Williams drives around Texas guard Jase Febres during the first half of a game in Austin, Texas. Williams, who played at NMJC as a freshman, is one of about 60 players who were invited to the NBA Draft Combine this week in Chicago. At 6-foot, 7-inches, Kenrich Williams was not the tallest man on his basketball team. He wasn’t the second, or third, or even fourth tallest. In fact, he was actually tied for the seventh tallest. But that didn’t stop him from making an impact on the college basketball court. After playing one year at New Mexico Junior College and three more seasons at TCU, with his college career over, Williams has a chance to possibly be drafted by an NBA team late next month. But before he does that, he will take part in the NBA Combine going on right now in Chicago at Quest Multisport. He is listed as a forward for the draft combine. Kenrich Williams at NMJC in 2013. Having played his last game in the college ranks, Williams is one of more than 60 players who have been invited to the NBA Draft Combine. The combine started Wednesday and concludes on Sunday. The combine will air of ESPN2 today from 1 p.m. to 5 p.m.
Miller said he plans to watch the combine and see what Williams can do and show those NBA teams that might be interested in him. While at the combine, players will scrimmage and be tested on various skills, including their vertical leap. Potential draft picks will also go through a medical exam. Thursday, Williams was rated the top NBA Break Right Shooting Percentage with an 80 among all forwards. The next four prospects all scored a 60. His 80 in NBA Corner Left Shooting Percentage was tied for first with three others. Williams had an 80 and was also tied for first in NBA Top Key Shooting Percentage with three others. He scored a 65.5 to take second in On The Move Fifteen Shooting Percentage. Williams was a big part of the TCU basketball team during his three years with the Horned Frogs. As a senior this past season, Williams started all 32 games he played in. During his junior campaign, Williams started in 36 of the 37 games he played. He sat out the 2015-16 season with a medical redshirt, but started 17 of the 33 games he played in back in 2014-15 as a sophomore. Williams’ final college game for TCU (21-12) was a 57-52 loss to Syracuse in the first round of the NCAA Tournament. Williams led the Horned Frogs with 14 points and eight rebounds. He played in 102 games, starting 85 of them, averaging 11 points a game to go with 9.8 rebounds, 2.7 assists, and 1.8 steals. This past year, Williams had his best season scoring, averaging just over 13 points a night while grabbing 9.3 boards. 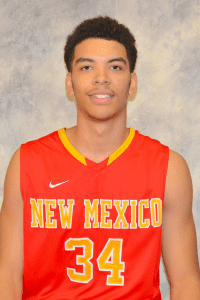 Before becoming a centerpiece for TCU, Williams starred right here in Hobbs for New Mexico Junior College. He played one season with the Thunderbirds, his freshman season back in 2013-14. He helped the T-Birds make it to the NJCAA Men’s National Championship Tournament where they lost 102-94 to Indian Hills in the second round. The former T-Bird started 32 of the 34 games he played for NMJC and averaged 10.1 points a game while pulling down almost seven rebounds a night. He was the third leading scorer on the team, behind Jeff Newberry (13.5 ppg) and Chris Boucher (12.1 ppg). Williams had 18 games with double figure scoring and six games with double figure rebounds. Williams had a season-high 23 points in an 81-72 win over Clarendon College while his season high in rebounds were 15 in a 72-63 loss to South Plains College. Boucher is currently with the Golden State Warriors G-League team in Santa Cruz, Calif. He has played one game for the defending NBA champions this season, a 117-106 home win over the Los Angeles Lakers on March 14.